Last week, Apple executives announced that the company is working on an updated Mac Pro that features a revamped modular design to accommodate regular component upgrades. 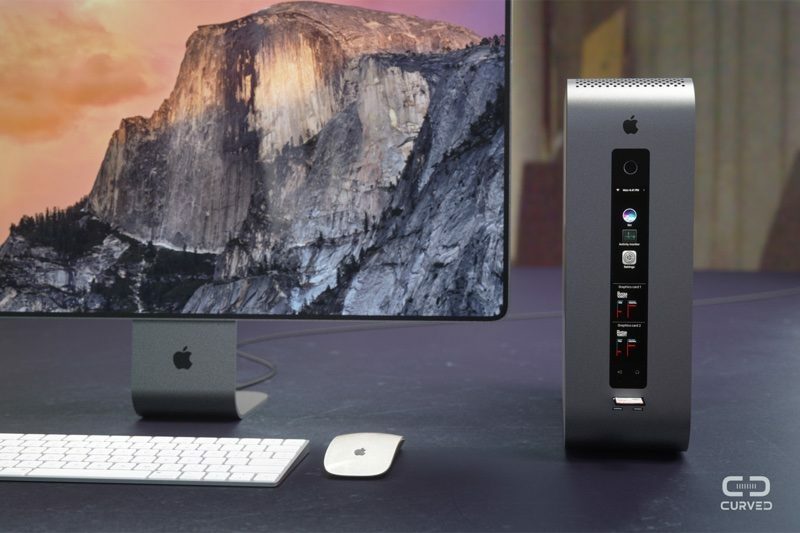 The launch of the new modular Mac Pro is at least a year away as development has just started, so we have no idea what the machine will look like when it's finished, but that hasn't stopped designers at CURVED/labs from dreaming up a conceptual design that includes a simple Mac mini-style box and a matching Apple-branded display. The imagined Mac Pro features a design that's entirely upgradeable, with two slots for full-sized graphics cards, rotating housing sides, and easily accessible sections for the processor, RAM, and storage. Holes on the top are designed to allow hot air to escape, and there are added features like a Touch ID power button, a Touch Bar for accessing information on included components, and USB-C, USB-A, and HDMI ports, along with a microphone and a headphone jack. Accompanying the imagined Mac Pro is a revamped 27-inch Apple "Cinema Display" with ultra thin bezels, an iMac-style stand, and and USB-C ports at the back. 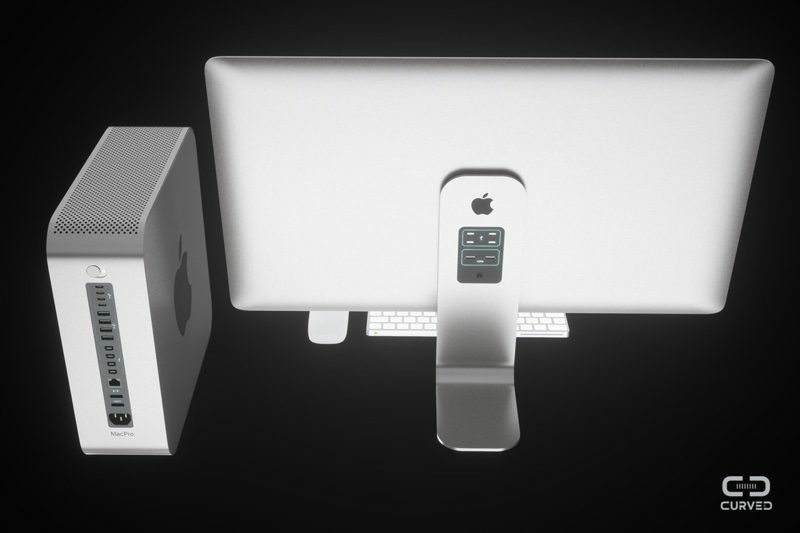 Again, this is in no way representative of what the finished Mac Pro might look like, but it does imagine features that are in line with what Apple executives have said about the Mac Pro so far. It's going to be a high-end high-throughput machine that will facilitate regular upgrades to meet the needs of Apple's pro user base. And given its modular nature, it will ship with an Apple-branded "pro" display. Apple is in the process of "completely rethinking" the Mac Pro and execs say it will take "longer than this year" to finish. What that means is not entirely clear, but one rumor has suggested it might not launch until 2019. Apple has a dedicated team working on the machine, which will serve the company's "most demanding pro customers." These are always hilarious. They never look like something Apple would design because they're almost always based off of old designs that they aren't going back to. And that monitor would never even stand upright. It's like this designer doesn't know how gravity works... that, or they assume gorilla clue on the bottom of the base plate. It looks so small that it will have the same issues the trash can one has. It looks like that would be a thermal nightmare. Nice work on the concept but it's not practical, just give us a more traditional tower form factor and we'll be happy. Yes, that can really fit four full-length nVidia Titan (or similar) GFX cards. What the hell is the obsession with size? I'd like to see a concept that shows the modular Mac Pro as big, or bigger, than the old cheese grater tower. Edit: Yes, I see it says "two slots for full-sized graphics cards" - with no room for anything else inside. Not that it could run two full-sized graphics cards considering there is no room for cooling or fans. Just don't let Jony Ive anywhere near it. um no. This looks horrible. Lets put this into the "what not to do" pile. I'll keep my shiny cylinder thanks. This wouldn't solve anything - the thermal issues nor the expandability. Just the same thing in a rectangular shape. 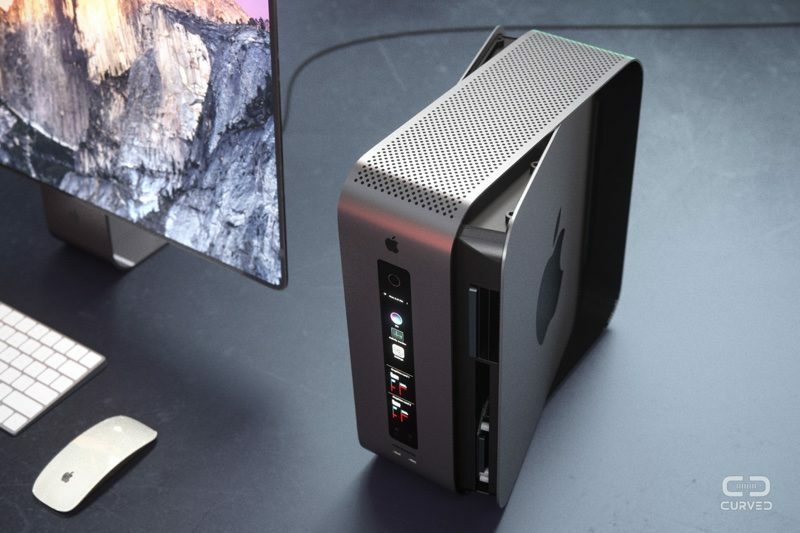 As some others have said already, I think this misses the mark, though it's well designed and looks nice, it doesn't really fall into line of what Apple probably wants the next Mac Pro to look like.